Wood,Gas,and Pellet Heat for Northumberland and beyond! Wood heat has been chosen by over one million Canadian families to make up a significant fraction of their homes heatings system.Wood is an important and renewable source of warmth and comfort, not to mention the security it provides during power outages and as a hedge against rising fuel costs. Wood heat has to be done right. 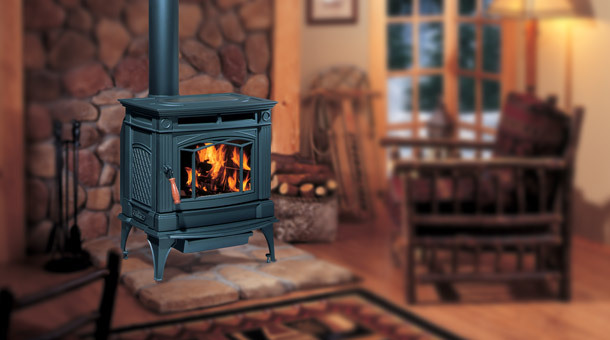 The consequences of improper installation, or using green wood or incorrect burning technique can be serious, so it makes sense to rely on wood heaters that meet the highest industry standards and come with the industry's most comprehensive Lifetime Warranty. and that comes standard with Regency Fireplace Products! The other critical factor in wood heat safety is making sure your purchase, installation, and inspection have been done by a WETT-certified retailer, technician or chimney sweep. WETT is the designation used by individuals who have met the criteria of the Wood Energy Technology Transfer program. This is Canada's national training and certification system for wood heat professionals. Flue Crew Chimney Services is proud to be certified to this standard and for inspection services as well. And we are proud to introduce our line of outstanding wood heaters. We invite you to look around our website, at some of the examples of Regency wood, gas and pellet burning stoves. Then come down to the store and talk to us about your needs. Take advantage of our years of experience, and the wide selection of heaters from Regency to custom tailor a heating solution that fits your needs exactly. Flue Crew Chimney Services is fully WETT certified. We are fully insured also. There are two types of insurance required, one of which is specific to the inspection related business, and we are covered for it as well! We are also a TSSA registered contractor! We are fully trained by WETT, the non profit organization that regulates the wood fuel side of solid fuel installations and codes. Our WETT certification information is available on request or on the wettinc.ca website. We are licensed for chimney sweeping, installation and design of wood heat systems, SITE inspection certified. Sales and installation of rigid and flexible lining systems for existing masonry chimneys and full chimney systems installations & repairs are available at Flue Crew Chimney Services. Chimney sweeping is among the basic essential home services we offer. Cleaning your chimney should be an annual mandatory chore if not more frequent. Poorly maintained chimneys affect the entire system and lead to degradation and deterioration, which are certain results. Among the first questions asked by your insurer, if you have a claim to pursue, may be " have you had the system cleaned and maintained"? If your answer is " No", your insurer may deny your claim as chimney fires and blockages that result in damage claims are totally preventable. Regular maintainence is the key! Inspections of wood heat systems is an area with some confusion. Usual reasons for inspection calls are: tagged by the fire department after a chimney fire; change of insurance company, random call from insurance company, or Real Estate transactions. No one ought to enter into a Real Estate transaction that includes a wood burning system of any kind without an inspection by a trained professional. Likewise, homeowners ought not take lightly the value of the inspection, especially in the event of a catastrophic fire. Masonry fireplaces are particularly difficult to inspect as the masonry tends to disappear inside walls and ceilings and attics and places with little or no access for viewing and measuring for proper clearances. Some companies will not perform inspection services for installations other than their own for liability reasons. Flue Crew Chimney Services is quite confident in our training and expertise to properly, thoroughly inspect any wood heat system and deliver the report immediately to whomever ordered it. Wood heat isn`t for every customer. Not to detract from the obvious green energy benefits in any way at all, but some folk, seniors for example, want less to do with the work that comes with wood heat. Carrying the wood can become a problem after a certain age or degeneration in physical abilities. This is a fact of life and no offense to anyone at all. In that regard then, turning the thermostat up is sometimes the most convenient! That`s why we do furnaces too! Keeprite and Goodman furnaces are available at the Flue Crew! 10 year parts and labour warranty and 25 years on heat exchangers. Rolltec Rolling Systems provides our retractable awnings. Carrying the best warranty and finest engineering and materials used in the production of these beautiful creations! Remote control availability for super convenience and automatic operation in case of wind, rain and sun! Bio ethanol fireplaces, portable , outdoor fireplaces and wall mount fireplaces from Eco-Feu. No vent required! Safe to use indoors or out! Our wood pellet grills by Traeger are a whole new experience in food that you need to try to believe! No flare ups! No fires! Digital temperature control fine enough that you can bake, as in cakes and cookies and pies, in a Traeger Wood Pellet Grill! 3 year warranty bumper to bumper. Be sure to check the links to the manufacturers web pages for the latest details about all the excellent products available from Flue Crew Chimney Services.